Nov. 8, 2011: 300 Winnipeggers demonstrated at the Manitoba Legislature and the Winnipeg Remand Centre to urge the Manitoba Government to join Quebec, Ontario and Newfoundland and Labrador in opposing the Harper government’s omnibus crime bill, misleadingly titled the Safe Streets and Communities Act (aka Bill C-10). Their key message, “time does not stop crime” rebutted the government’s contention that locking up more offenders for longer periods was an effective crime prevention technique. As I noted in an earlier post, the John Howard Society of Manitoba estimates Canadians will pay $2 billion annually to cover the costs of the bill, which calls for mandatory minimum sentences for a wide range of crimes regardless of individual circumstances. While this will trigger a huge increase in the number of inmates and a prison construction boom, it will do nothing to address the root causes of crime, nor will it lead to the rehabilitation of offenders. 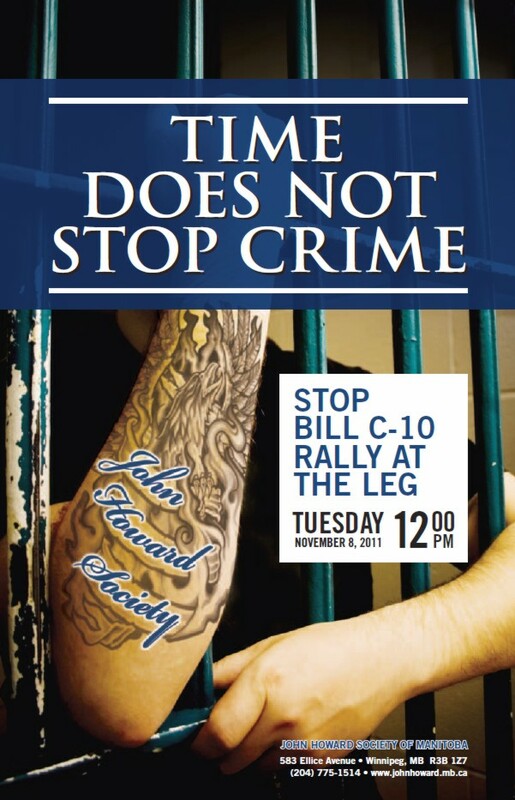 For more information about C-10, contact the John Howard Society of Manitoba. And let your MP know what you think.